Have I ever mentioned that I love, love, love decorating? Well, I love it! 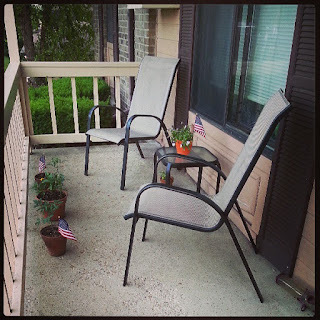 Although I don't have a house, I like decorating my home, and this year is the first year I have decided to decorate for the 4th of July. 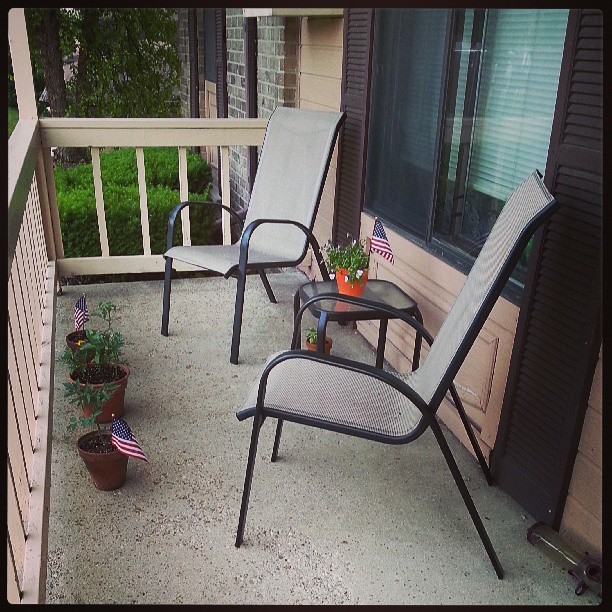 I don't have a lot of decorations to offer, so I did some modest decorating on my porch with my plants, vegetables, and some mini American flags. I also added a cute red, white, and blue bow to my front door, but you can't see that in the picture below. I consider decorating to be a ritual that prepares for something exciting to come. That something can be anything; that something can be a holiday, a loved one's birthday, honoring a couple, father, mother, or welcoming a new person into the world. (Decorating a nursery!) I believe that half the fun in celebrating the thing that is to come is preparing for it by taking the time and initiative to honor it. Love the porch decor! In fact, it's inspired me to pull my flags out from the box in the basement and do the same. :) Like you, I have a special space where I write, read + reflect. It's my patio. I just spent the best part of the morning there--which is bliss! :) T.